The Yates Center Wildcats have been the feel-good story of the season. Yates Center opened the year on a 23-game losing streak that dated back to the 2010 season. In his first season, Ben Wiehn directed the Wildcats back to the playoffs. On Tuesday, they earned their first playoff victory since 1983 by beating West Elk 38-36. Showing how much Yates Center has improved the course of the season, West Elk beat the Wildcats 52-6 in Week 2. Quarterback Caleb DeNoon has had a successful senior season, passing for 659 yards and nine touchdowns while rushing for 1,546 yards and 31 touchdowns. Austin McNett has rushed for 767 yards and 11 TDs. Robert Arnold has 23 catches for 401 yards and five touchdowns. Clifton-Clyde is coming an impressive 42-26 victory against Peabody-Burns. Quarterback Caleb Gelino leads the Eagles offense, rushing for 1,293 yards and 20 touchdowns while passing for 579 yards and seven touchdowns. Austin Biggerstaff and Cortne Vancampen have rushed for 788 and 636 yards, respectively. William Ohlde has 21 receptions for 361 yards and five TDs. The Trojans’ only loss was 36-22 to Madison in Week 2. Other than that, Marais des Cygnes Valley has scored at least 47 points and allowed no more than 22 points in every game. MdCV advanced to the second round of the playoffs by beating South Haven 48-18 on Tuesday. It was the Trojans’ first playoff win since 1986. Kaden Vanderpool returned a punt for a touchdown during the victory. The Trojans’ 540 points on the season are second to only one team in 8-Man Division I. Ironically, the team they are behind is Osborne, which has scored 594 points. The undefeated Bulldogs have five games where they have scored 60 points or more. Osborne advanced by holding off perennial power Madison 40-34 on Tuesday. Kenton Ubelaker rushed for 132 yards and three touchdowns, while catching 10 balls for 145 yards against Madison. 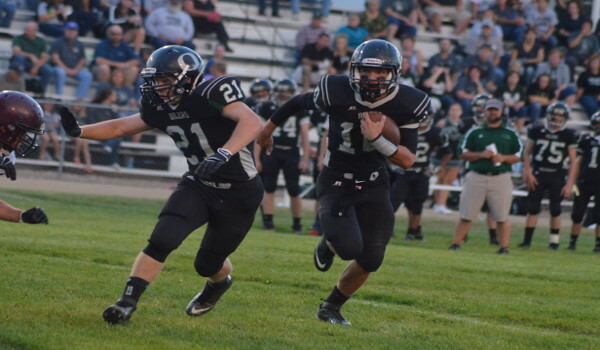 On the season, Ubelaker has rushed for 1,155 yards and 21 touchdowns. This marks Central Plains’ second playoff berth since the school formed from the consolidation of Quivira Heights and Claflin four years ago. Central Plains went 1-1 in the 2011 postseason. Hodgeman County, a consolidation of Jetmore and Hanston, is in its third trip to the state playoffs. The Longhorns finished 1-1 in 2010 and 2012. The winner Saturday would have the deepest advancement in school history. Central Plains’ only loss came to high-powered Victoria in Week 4, 66-28. Since then, the Oilers have tallied at least 36 points in each contest. The Oilers rank ninth in the classification in scoring offense at 49 points per game, but have allowed 22.4 per contest. Sophomore Braeden Crites has enjoyed a big year, completing 89 of 161 passes for 1,796 yards and a 32/4 TD/INT ratio. He is also the leading rusher with 623 yards and 13 scores. Junior Layne Bieberle has 43 catches for 1,017 yards and 22 scores, collected 105 tackles and 10 interceptions and had five defensive/special teams scores. Hodgeman County is one of three undefeated teams, along with Kiowa County and Osborne, but has played the classification’s No. 44 strength of schedule. Central Plains has played the No. 18 schedule. Alex Kreger leads the Longhorns with 1,357 rushing yards and 25 touchdowns. He has passed for 622 yards and seven more scores. The Longhorns have outscored teams by an average score of 49-10 and rank first in scoring defense. Eight-Man Division I always produces a couple of surprise teams, such as South Gray and Rock Hills the last two seasons. Central Plains, led by Crites, Bieberle and its challenging schedule, earns a close win. Kiowa County has outscored opponents 510-102 against the No. 44 strength of schedule in Eight-Man Division I, while Hoxie has outscored teams 464-162 with the No. 16 strength of schedule. The Indians’ lone loss came in Week 2, 36-28, to undefeated Wallace County, easily the Wildcats’ closest game. On Tuesday, Kiowa County won the first playoff game in the school’s four-year history with a 50-14 win versus Solomon. The Mavericks’ run-heavy offense has rushed for 335 yards per game. Senior quarterback Trever Powell has 197 carries for 2,284 yards for 37 scores. He has also completed 9 of 24 passes for 162 yards with five scores against no interceptions. Defensively, Aaron Heft has 16 tackles for loss, while Powell has seven interceptions and four passes defended. Hoxie won the first playoff game with fourth-year coach Lance Baar. The Indians went 6-3 two years ago, 7-3 last season and 9-1 this year. Hoxie hasn’t won more than one playoff game in a year since 2005. The Indians are balanced with senior quarterback Chase Kennedy and junior running back Connor Katt. Kennedy has completed 47 of 75 passes for 558 yards with a 9/2 TD/INT ratio. Katt has emerged as one of eight-man’s top running backs with 170 carries for 1,425 yards with 25 scores, and Kennedy has 143 carries for 862 yards with 16 scores. Katt set career highs with 34 carries for 218 yards and one was off his career best with three TDs. The Indians are a little more balanced, plus they are playing at home. Hoxie moves on in a close contest.